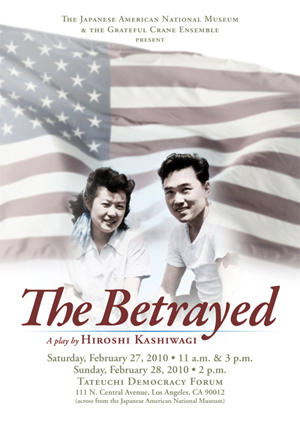 Feb. 27-28—“The Betrayed,” a play about a young Nisei couple torn apart over theinfamous “loyalty” questions #27 & #28, will have its Southern California premiere on Saturday, Feb. 27 at 11 a.m. and 3 p.m., and Sunday, Feb. 28 at 2 p.m. at the Tateuchi Democracy Forum in Little Tokyo, downtown Los Angeles. Presented by the Grateful Crane Ensemble and the Japanese American National Museum (JANM), “The Betrayed,” is written by award-winning Nisei playwright, actor, poet and author Hiroshi Kashiwagi and directed by Darrell Kunitomi, with music by Scott Nagatani. Kashiwagi, 87, is based in San Francisco and has written numerous plays over his career including “Live Oak Store” and “Laughter and False Teeth,” both of which were produced and presented in Los Angeles by the East West Players. In “The Betrayed,” Kashiwagi brings together Grace, a sophisticated city girl from Seattle, with Tak, a country bumpkin from rural California. Despite their differences, the attractive 20-year-olds fall in love. Sponsored in part by Tomiye Sumner, Ernest Doizaki, Manabi & Sumi Hirasaki, Hiroshi & Sadako Kashiwagi and Paul N. Shishima and the California Civil Liberties Public Education Program (CCLPEP), “The Betrayed” cast features Brian Takahashi and Diana Toshiko as the young Tak & Grace, and Kurt Kuniyoshi and Helen Ota, who play the couple 40 years later. General admission tickets are $25; $23 for JANM members, seniors and students and a newly added $20 group rate for groups of ten or more. The Sunday show at 2 p.m. is nearly sold-out, but tickets are still available for the two Saturday matinees.